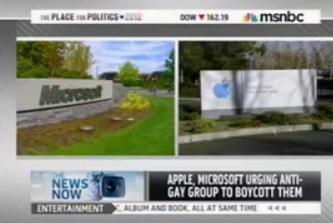 On Wednesday’s MSNBC Live, anchor Thomas Roberts reported that Apple and Microsoft were “marrying up, asking the National Organization for Marriage, and its supporters, to boycott their companies” in response to a leaked NOM memo that detailed a strategy to divide gay people and black people. The leaked memo was real; the boycott request was not. An unamused Roberts apologized on air today, noting that the item was based on a Huffington Post satire piece. So what gives? The National Organization for Marriage singles out Starbucks, and those yuppie bean heads get all the attention? We have to read in the Seattle Stranger how “[t]here has been an incredible Facebook campaign of photos of people drinking coffee at Starbucks.” Where are all the photos of happy people tapping away on Windows machines knowing that they, too, are supporting equality for all? What about us? We’ve even got a rainbow in our logo. Boycott us, National Organization for Marriage! Now! Though Apple’s stock is doing very well, we still are a little envious that Starbucks’ stock shot up $1.41 the day after the announcement of the National Organization for Marriage’s boycott, and it continues to rise. We all appreciate a stock bump. NOTE: This piece is satirical. All quotations are fabrications for the purpose of satire. Roberts didn’t seem to approve of the satire, but maybe reverse-boycotts like this are an idea whose time has come. Wouldn’t it be great if there was a competitive market for doing the right thing?